Located on the west campus between Muir and Marshall Colleges, the North Torrey Pines Living and Learning Neighborhood will be a vibrant mixed-use community incorporating residential, academic and administrative space. Five years from now, the UC San Diego campus will be almost unrecognizable to anyone who hasn’t watched the transformation unfold. With everything from new buildings and bridges to the arrival of the trolley, the shift in the campus’s physical appearance will be profound. 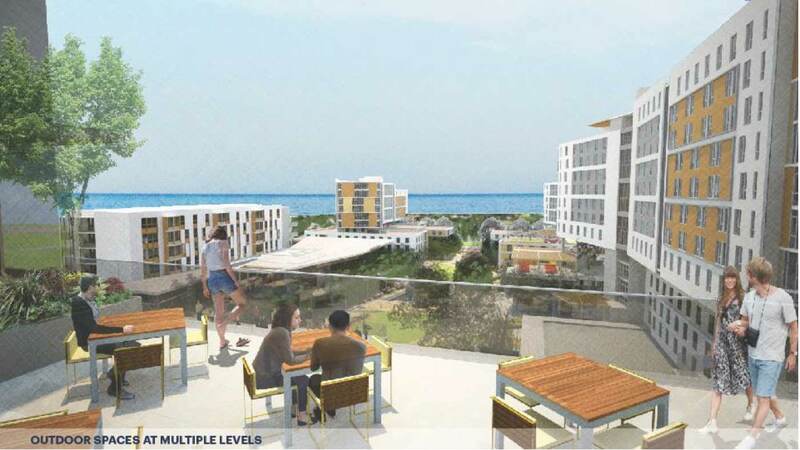 Interested in learning more about the Long Range Development Plan for the La Jolla campus? Then stop by the next upcoming Open House. 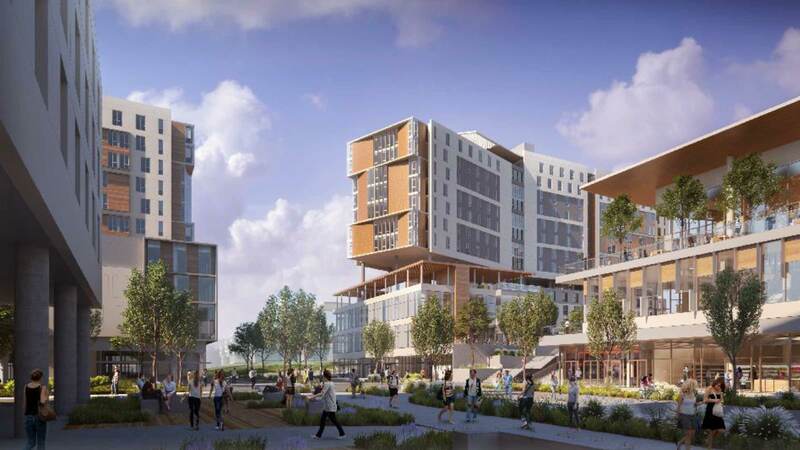 UC San Diego’s unprecedented expansion is designed to accommodate increasing student enrollment—expected to approach 40,000 students within the next five years. Much of the expansion is also part of the campus’s existing Long Range Development Plan, which guides the physical growth of the campus based on projected enrollment. Last updated in 2004, the Long Range Development Plan is being updated again. Once approved by the UC Regents—which is expected to take place in 2018—the update will enable the campus to continue planning in a thoughtful and sustainable manner. Much of the development will take place west of Interstate 5 on the main campus. The largest project to come online will be the North Torrey Pines Living and Learning Neighborhood between Muir and Marshall Colleges. Designed to be a vibrant mixed-use community, the complex will house two new academic buildings—one for Social Sciences and one for Arts and Humanities—as well as 2,000 undergraduate beds, 1,200 underground parking spaces and a market, dining hall and craft center. The neighborhood will also become the new home for Sixth College. Expected to be completed in fall 2020, the project will also realign Scholars Drive and make public realm improvements to Ridge Walk along the eastern edge of the neighborhood. This will enhance the movement of people and bikes through the campus core, an ongoing goal for UC San Diego. The Biological and Physical Sciences Building—located next to Pacific Hall in Revelle College. Expected to be completed in fall 2018. The Engineering and Interdisciplinary Building—located in the Warren College neighborhood, overlooking a canyon on the north side of campus. Expected to be completed in fall 2021. The Design and Innovation Building—an addition to the existing Structural Materials and Engineering Building, near the planned Pepper Canyon trolley stop. Expected to be completed in summer 2021. Thoughtfully-designed open space will be an integral part of the North Torrey Pines Living and Learning Neighborhood. There will be places to socialize and relax as well as pedestrian and bike-friendly pathways and elements. The Gateway Plaza project, located off Rupertus Lane in the center of campus, will house student-centered resources such as career services, alumni services and international center programs as well as Extension and administration offices. Phase one of Gateway is expected to be completed by fall 2021 with phase two expected to be finished by fall 2023. There will also be two new parking structures. Expected to be completed in 2018, the Osler Parking Structure will be located at the corner of Gilman Drive and Osler Lane near the School of Medicine. The structure will replace parking lot P604, providing approximately 1,300 spaces. The Voigt Parking Structure—expected to be completed in early 2019—will be located next to Geisel Library and will provide approximately 800-900 spaces. While the west campus will be a hub of activity over the next few years, the east campus is no stranger to construction. 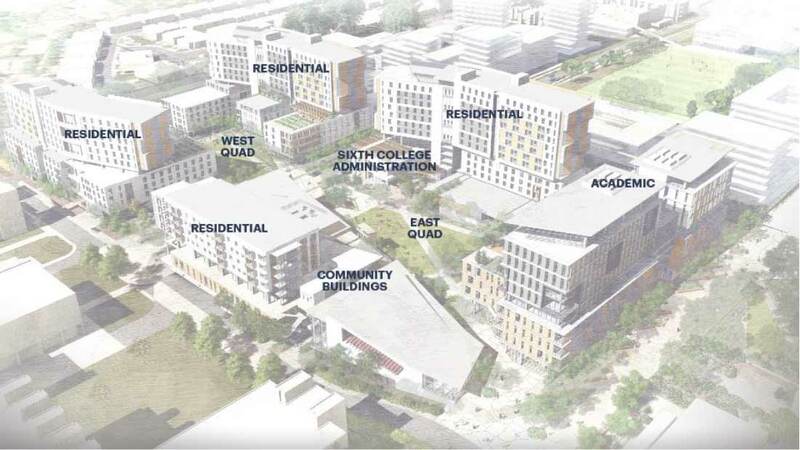 Two large graduate student housing projects—Nuevo West and Nuevo East—are slated for completion in late 2019 and early 2020, respectively. UC San Diego Health’s Outpatient Pavilion is nearing completion and the Center for Novel Therapeutics is expected to open in 2019. Construction on the Voigt Drive trolley station, one of two trolley stops on campus, will transform the look of the east campus near The Preuss School. The Gilman Bridge, which is currently under construction, will also connect east and west campus once completed, enabling better vehicle, pedestrian and bicycle movement. What lies ahead over the next 15 to 20 years? The Long Range Development Plan update for the La Jolla campus is outlining these future possibilities for growth. Building heights at the North Torrey Pines Living and Learning Neighborhood will be varied with some individual buildings reaching up to 14 stories. Views will look into and out of the campus. Updating the plan is a process that takes several years and involves a variety of stakeholders. First, academic and enrollment plans are updated and background and support studies are prepared. The Long Range Development Plan is then updated and a draft environmental impact report prepared. Outreach is conducted with elements of the plan presented to a wide range of interested people and groups, including the campus community, environmental organizations, business groups, neighborhood associations and residents, and elected officials and staff members of local government. 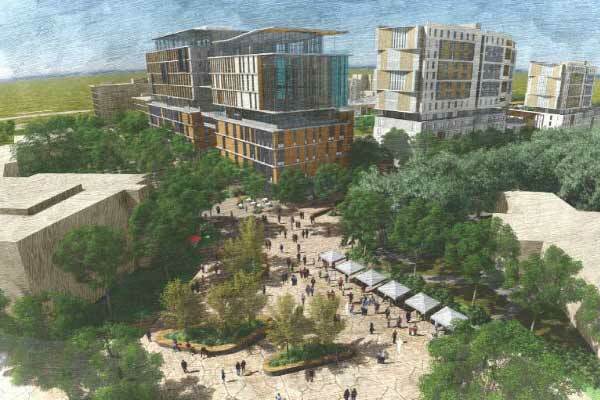 After extensive outreach, the Long Range Development Plan and its environmental impact report will be finalized and presented to the UC Regents for approval. 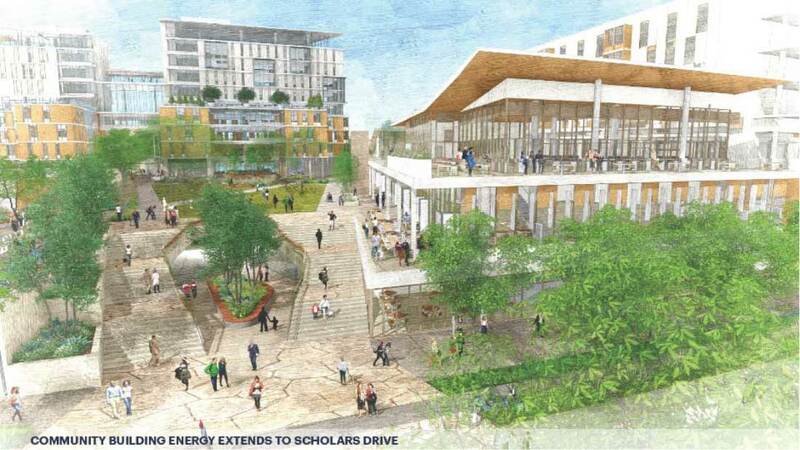 The North Torrey Pines Living and Learning Neighborhood will provide undergraduate housing, a new home for Sixth College, new academic space for the Divisions of Social Sciences and Arts and Humanities, and 1,200 underground parking spaces as well as a market, dining hall and craft center. Once approval is given, expected next year, the update will guide development of the campus through 2035. The Open House will be held Tuesday, May 23 from 11 a.m. to 2 p.m. in the Forum Room of the Price Center East. Attendees are welcome to stop by at any time. For more information, visit the Long Range Development Plan website.